Social media has given teens the ability to instantly connect with others and share their lives through photos, videos and status updates. Teens themselves describe these platforms as a key tool for connecting and maintaining relationships, being creative, and learning more about the world. But they also must contend with more negative aspects of social media use, such as drama and bullying or feeling pressure to present themselves in a certain way. 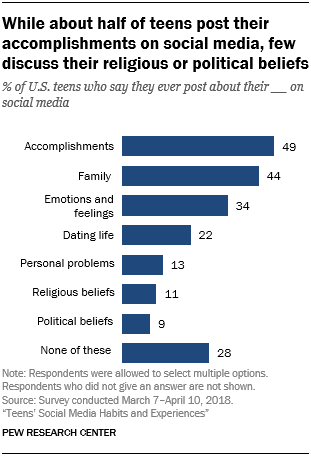 When asked what topics they post about on social media, roughly half of teens say they post about their accomplishments on social media, while 44% say they post about their family. Around one-third (34%) say they share things related to their emotions and feelings on these sites, while 22% report posting about their dating life. Relatively few teens – around one-in-ten – say they share things related to their personal problems or their religious or political beliefs on social media. There are some age and gender differences in the topics teens share on social media. Older teens are more likely than their younger counterparts to post about their romantic relationships: 26% of teens ages 15 to 17 say they post about their dating life on social media, compared with 16% of 13- to 14-year-olds. 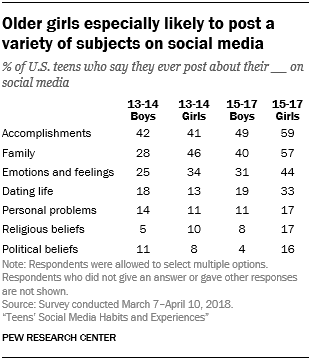 Meanwhile, girls are more likely than boys to say they post about their family (53% vs. 36%), their emotions and feelings (40% vs. 29%) or their religious beliefs (14% vs. 7%). And older girls are especially likely to post about a variety of subjects – including their dating lives, their family, their emotions and their religious or political beliefs, compared with older boys or younger teens. Although the proliferation of smartphones has given teens the ability to constantly share different aspects of their lives, this survey finds that many teens regularly forego posting selfies, videos or other updates of their lives to social media. 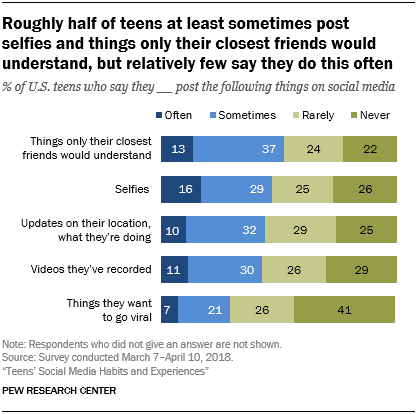 Some 45% of teens say they often or sometimes post selfies on social media, with 16% saying they do this often. Similar shares of teens say they at least sometimes post things only their closest friends would understand (50%), updates on where they are or what they’re doing (42%) or videos they’ve recorded (41%). A smaller share of teens report regularly posting things that they want to go viral (29%). Notably, in each instance close to half or more of teens say they rarely or never share these types of posts on social media. There is some demographic variation in the types of content teens say they post to social media. Girls are much more likely than boys to post selfies: Six-in-ten girls say they often or sometimes do this, compared with 30% of boys. And while two-thirds of black teens and about half (51%) of Hispanic teens report regularly sharing selfies on social media, that share drops to 39% among white youth. Black teens are also much more likely than whites to say they at least sometimes post things they want to go viral (41% vs. 25%). A central conversation surrounding social media and young people is the impact these platforms may be having on the emotional well-being of teens. A majority of teens believe social media has had a positive impact on various aspects of their lives, the survey finds. Fully 81% of teens say social media makes them feel more connected to what’s going on in their friends’ lives, with 37% saying it makes them feel “a lot” more connected. Similarly, about seven-in-ten teens say these sites make them feel more in touch with their friends’ feelings (69%), that they have people who will support them through tough times (68%), or that they have a place to show their creative side (71%). But although sizable shares of teens encounter positive experiences on social media, some report encountering drama or feeling pressure to present themselves in a certain way. Some 45% of teens say they feel overwhelmed by all the drama on social media, while roughly four-in-ten say they feel pressure to only post content that makes them look good to others or that will get lots of comments or likes. Others believe social media has had a negative impact on their self-esteem: 26% of teens say these sites make them feel worse about their own life. Still, just 4% of teens indicate these platforms make them feel “a lot” worse about their life. The survey also presented teens with four pairs of words and asked them to choose the sentiment that most closely matches how they feel when using social media. In each instance, teens are more likely to associate their social media use with generally positive rather than negative feelings. 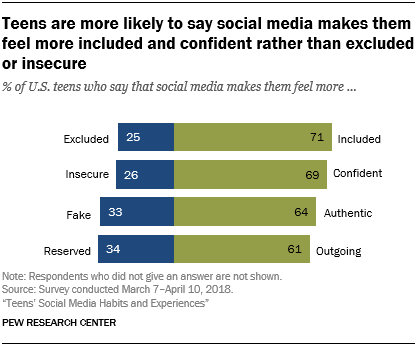 By relatively large margins, teens indicate that social media makes them feel included rather than excluded (71% vs. 25%), confident rather than insecure (69% vs. 26%), authentic rather than fake (64% vs. 33%) and outgoing rather than reserved (61% vs. 34%). Interestingly, there are few demographic differences on these questions. For example, teen boys and girls are similarly likely to view their social media use in these ways, as are older and younger teens. Just as relationships get forged and reinforced on social media, friendships can turn sour and require teens to prune their friend or follower lists. More than four-in-ten teens (44%) say they at least sometimes unfriend or unfollow people on social media, including 14% who say they do this often. But a somewhat larger share of teens say they engage in this behavior relatively sparingly. Just over half of young people report that they rarely (39%) or never (14%) unfriend or unfollow people on social media. Teens who at least sometimes unfriend or unfollow people provide several reasons for deleting people from their friend lists on social media. But by far the most common reason (mentioned by 78% of teens who engage in this behavior) is that the person in question is simply creating too much drama. In addition, more than half of these teens (54%) say they have unfriended or unfollowed someone because that person posted too much or too often, and a similar share disconnected from someone because the person bullied them or others. A smaller share of these teens say they unfollow others because they act differently online than in person (43%) or post political views they disagree with (22%). In general, girls are more active than boys at disconnecting from others on social media. Roughly half of girls (52%) say they at least sometimes unfriend or unfollow people, compared with 35% of boys. And girls are nearly twice as likely as boys to say they often unfriend or unfollow people on these platforms (18% vs. 10%). But among youth who do engage in this practice, boys and girls largely do so for similar reasons – with one exception. Boys are more likely than girls to say they’ve unfriended or unfollowed someone because that person posted too much or too often (67% of boys who regularly unfriend say this vs. 46% of girls). 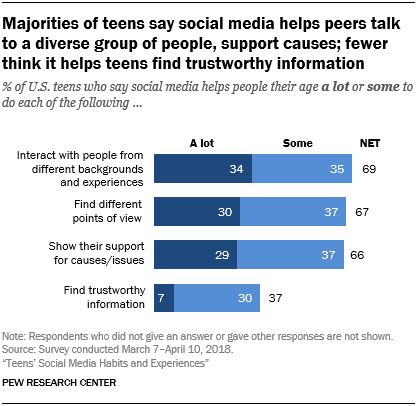 Majorities of teens believe social media helps people their age diversify their networks, broaden their viewpoints and get involved with issues they care about. Roughly two-thirds of teens say social networking sites helps teens at least some to interact with people from different backgrounds (69%), while a similar share credits social media with helping teens find different points of view (67%) or helping teens show their support for causes or issues (66%). But much like older generations, relatively few teens think of social media platforms as a source of trustworthy information. Overall, 37% of teens think that social media helps people their age find trustworthy information – and only 7% think these sites help “a lot” in that respect. Older teens are more likely than their younger peers to believe social media helps teens interact with people from various backgrounds. Fully 76% of 15-to 17-year-olds say this, compared with 59% of those ages 13 to 14. By a slightly lesser margin, older teens are more likely to say these platforms help people their age find diverse viewpoints (71% of older teens say this, vs. 60% of younger teens). Meanwhile, teens of all ages are similarly skeptical about social media’s role as a source of trustworthy information. While some youth play an active role in controlling the content they see in their social media feeds and preventing various figures of authority from viewing what they post there, a large share of teens rarely curate their online presence in this way. 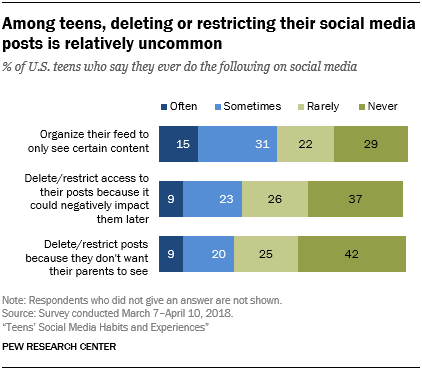 At a broad level, 46% of teens say they at least sometimes organize their feeds to only see certain types of content, although just 15% say they do this often. Indeed, 29% of teens say they never organize their social feeds in this way. It is even rarer for teens to delete or restrict access to their posts because they might be seen by their parents or negatively impact them in the future. Just one-third of teens say they often or sometimes delete or restrict access to things they share on social media because they are concerned it could negatively impact them later in life. And about three-in-ten teens say they delete or restrict posts because they don’t want their parents to view them. In both cases, only around one-in-ten young people say they do this often – and a plurality says they never do so. There are also few demographic differences in deleting or restricting social media posts because it could negatively impact them in the future or because they don’t want their parents to see what they’ve posted. But there are some age differences when it comes to taking steps to organize social media feeds. Older teens are more likely than their younger peers to say they regularly organize their feed in this way (51% of 15- to 17-year-olds do this vs. 37% of those ages 13 to 14).